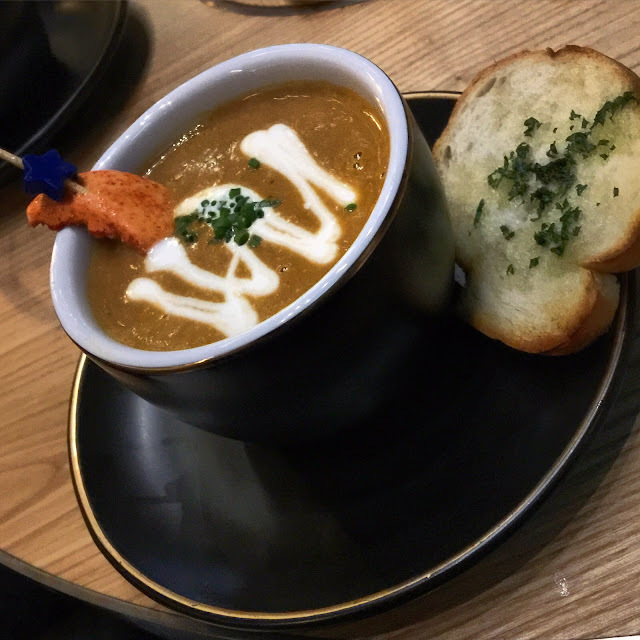 I can always trust The Boy to know where the latest, hippest restaurants are in Hong Kong, so I was cautiously excited about the restaurant Bisque in Lan Kwai Fong. I say cautiously, because I'm not a lobster fan (with the exception of lobster bisque) and this restaurant was supposed to be renowned for their lobster (and champagne). I arrived early and was greeted by a few intimate small booths lined with purple suede, each of which had an icebucket containing a bottle of champagne. With Ed Sheeran playing in the background and dim lighting emitting from dangling lights that resembled fireflies in glass light bulbs, the restaurant definitely leans on the romantic side. Opposite the row of tables is the bar, with the kitchen directly behind it. It's not a large space, but that only adds to the intimate vibe. On the menu are mainly lobster dishes, with a selection of raw and baked oysters - but unfortunately for us, they had run out that night. 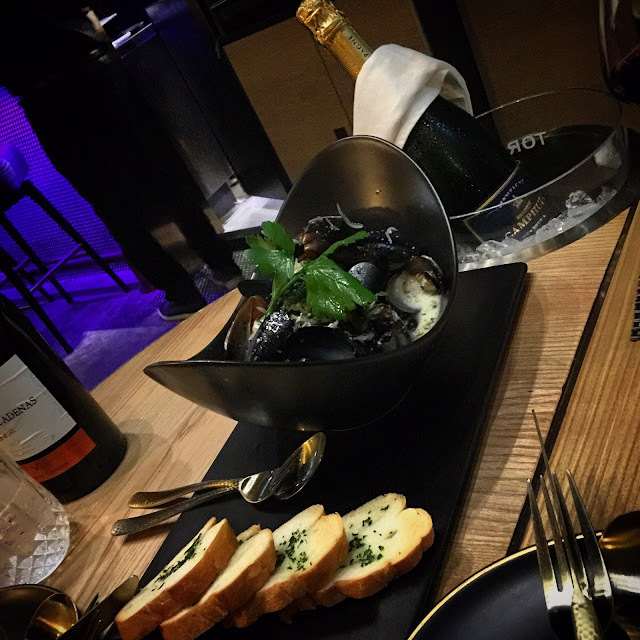 Instead, we ordered the mussels with white wine, onion and garlic, which smelt amazing, and were accompanied by toasted bread on the side. The mussels were delicious: light but with excellent flavour, and very few of the mussels were closed. We also ordered the bread basket, which comes with five different types of bread, round buns, flat bread, wholegrain etc. While I don't usually condone paying money for a bread basket (having been spoilt too much in Europe with complimentary bread at the start of every meal), this was perfect for dipping in the mussel sauce. The lobster bisque, their signature dish, came drizzled with thick cream on top and a lobster claw sticking out of the bowl, with toast on the side. We asked for one portion to be split into two, and the restaurant very obligingly served us the soup in two teacups. The claw was meaty and surprisingly sweet, and the lobster chunks in the soup were small but tasty. Our final dish was the lobster sliders, which were well presented with petals surrounding them. They came with fried vegetable chips (including sweet potato chips, which are a favourite of mine), but these didn't really hit the mark. 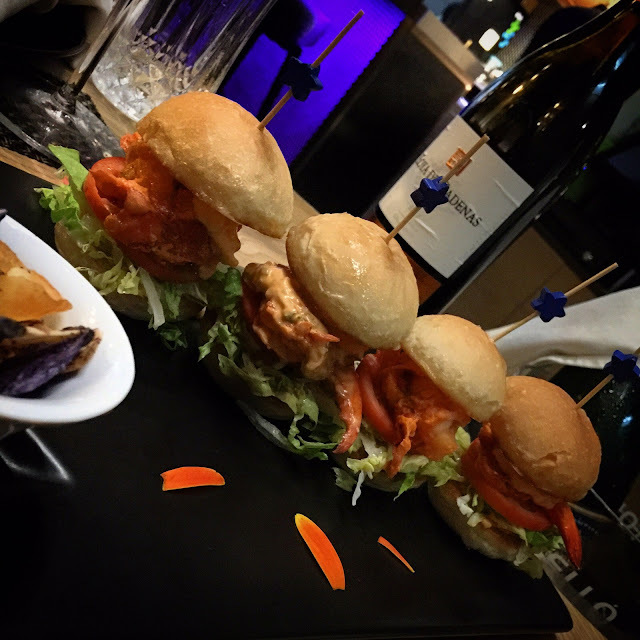 Instead, it was the slider that had a solid game: although biting into the bun made the tomato break (and consequently, the bun slightly soggy), the chilli mayonnaise (which was only mildly spicy) was excellent paired with the lettuce and fresh lobster meat.